Considered by many fans and critics as one of the finest voices (and vocal impersonators!) 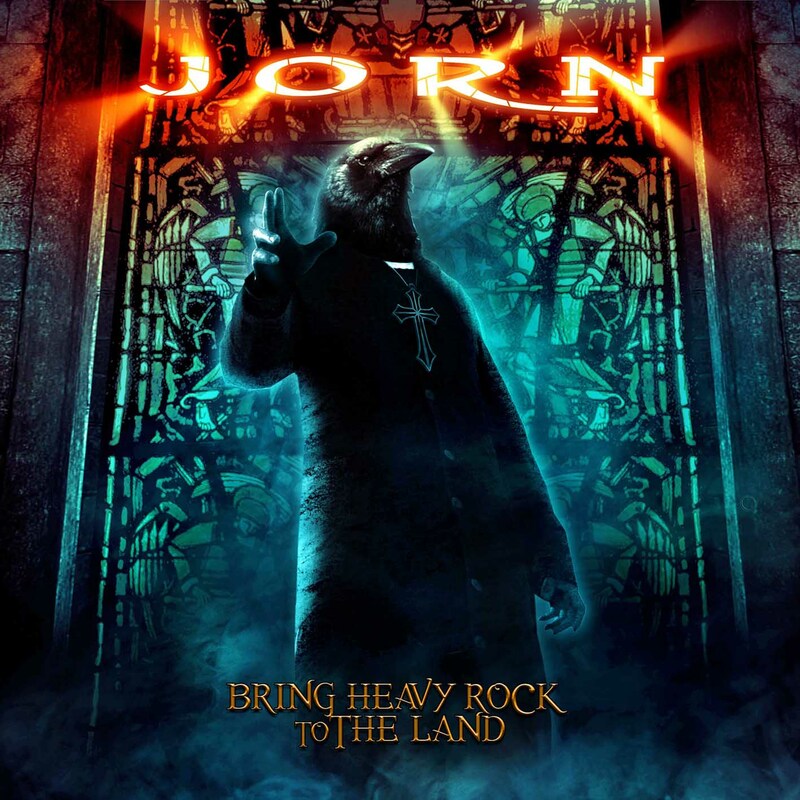 in Hard Rock, Jorn unleashes upon the world his seventh original studio album "Bring Heavy Rock to the Land": another slab of classic Hard Rock with 80’s Metal elements! Staying with the ‘if it aint broke, don’t fix it’ approach (a formula applied by many, but mastered by so few) Jorn has worked again with Tommy Hansen at Jailhouse Studios in Denmark who worked on the mix of the album, ensuring the right edge to the rich guitar and vocal sound that is now trademark to all Jorn releases. The line-up sees the return of Jimmy Iversen on guitar who appeared on “Spirit Black” but could not commit to touring for personal reasons. The pairing with Tore Moren works really well and gives Jorn sound the usual depth and solidity. Jorn Lande’s strong and diverse voice and solid songwriting skills have now become legendary in the Hard Rock world. In a career spanning over 30 albums releases (all done in the last 18 years, a feat that would take Axl 2000 years to complete)and as frontman for Millennium, Ark and Masterplan, Jorn was recently featured on projects such as Tobias Sammet’s “Avantasia” and Ayreon. “If you buy a Jorn album today, you know what you will get. This new album is more Hard Rock oriented than Metal I would say, but as usual it's not just one type of musical expression all the way through the album, but a variety of landscapes within the categories of rock and metal” states Jorn Lande! You are guaranteed to get your adrenaline going, with a riveting sound that has solid roots in classic hard rock/heavy metal music, such as Dio, Black Sabbath, Rainbow and Whitesnake. Known to me David Dio-dale! Last time I saw him (Firefest 07) I was a little disappointed as he seemed to be there to entertain himself and not the crowd by playing none of his more popular songs from his extensive collection. However I must admit that I’m very pleasantly surprised with this collection on ‘Bring Heavy Rock To The Land’ (great title by the way!). The title track shows Jorn at his best, melodic, hard rock. The epic length ‘A Thousand Cuts’ (a tad over 8mins) is more powerful metal than norm, more in the Dio/Sabbath style, and combines heavy chugging riffs with Jorn’s complementary and stong vocals. Like Saxon before, Jorn has chosen to cover the Chris Cross classic ‘Ride Like the Wind’ a song well suited to me made into a rock classic. Jorn (like Biff) doesn’t disappoint on this version either. ‘Chains Around You’ gives more than a passing nod to classic Rainbow (more JLT era than Dio or Bonnet) / Malmsteen, and as a fully fledged member of the Rainbow fan club (‘80-‘84), it’s nice to hear what Rainbow would sound like in 2012 and proves to be the highlight of the album. For some reason Jorn has reprised the Masterplan track, Time To Be King, which is OK, but I’d prefer another original please. ‘Ride to The Guns’ reminds me of the flash Sykes era Lizzy, particularly the track Thunder and Lightning. ‘Black Morning’ is a US Southern style Whitesnake meets Skynyrd bluesy ballad. Tracklisting : My Road; Bring Heavy Rock To The Land; A Thousand Cuts; Ride Like The Wind; Chains Around You; The World I See; Time To Be King; Ride To The Guns; Black Morning; I Came To Rock; Live And Let Fly (bonus track).